These two diggers are at Rāhui, near Charleston on the West Coast. 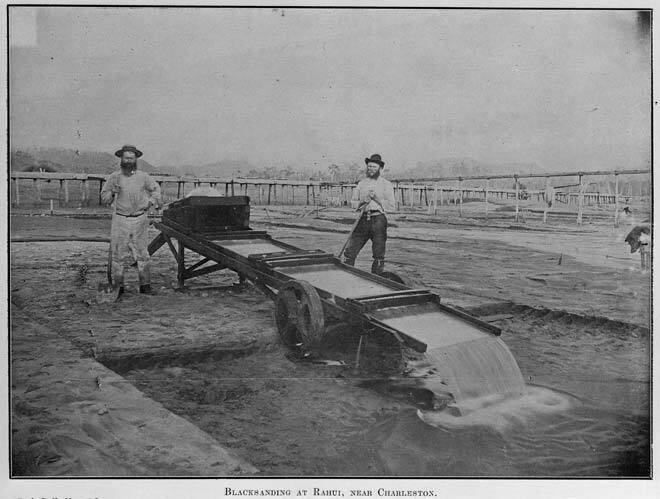 They are looking for gold in the heavy black sands by washing it over a riffle table. As beach gold was very fine, traditional riffle tables were not efficient. Copper plates covered with a film of mercury, like the ones being used here, recovered more gold. In the background is wooden fluming, which carried water to the beach workings.